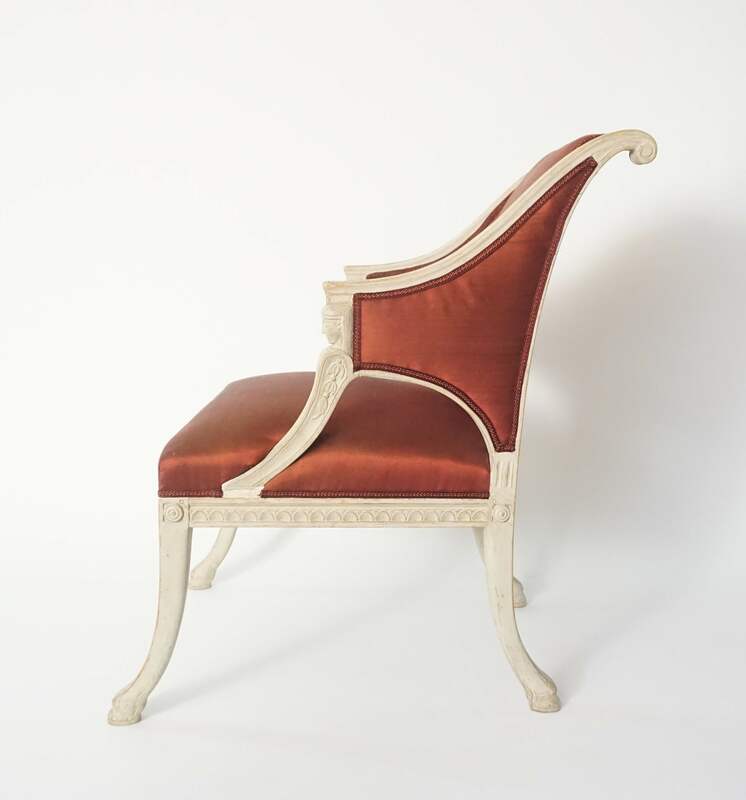 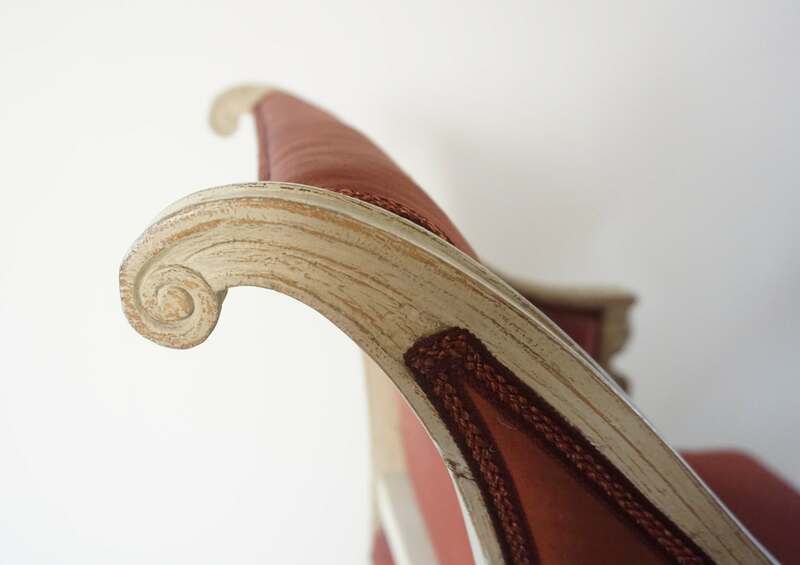 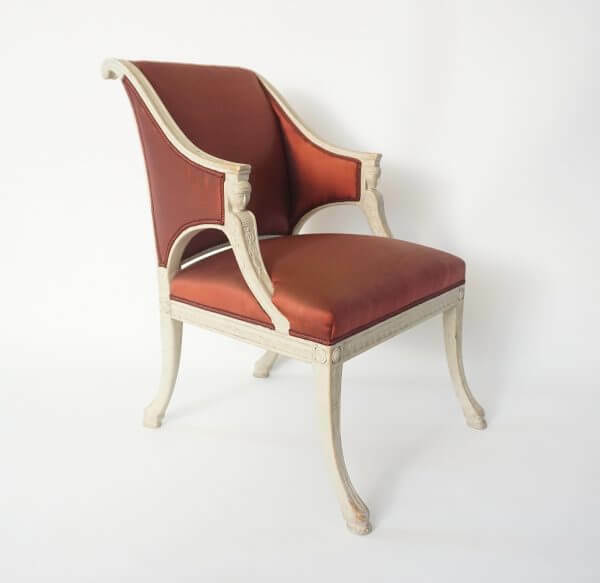 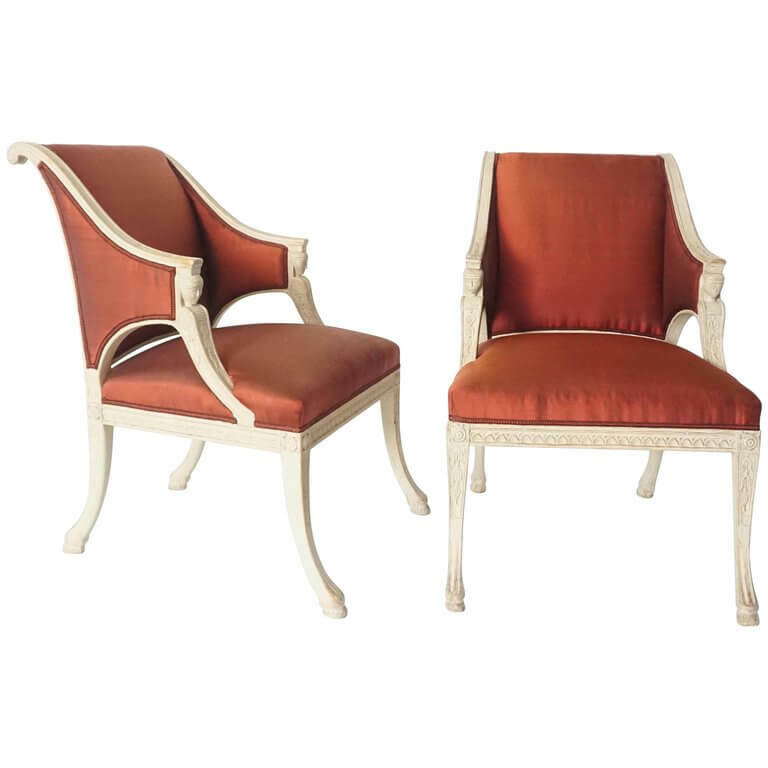 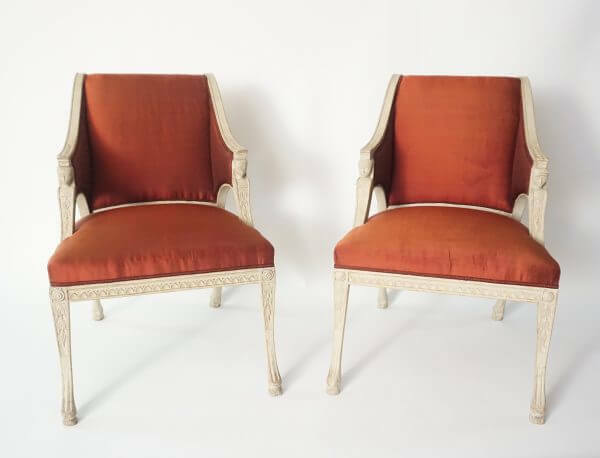 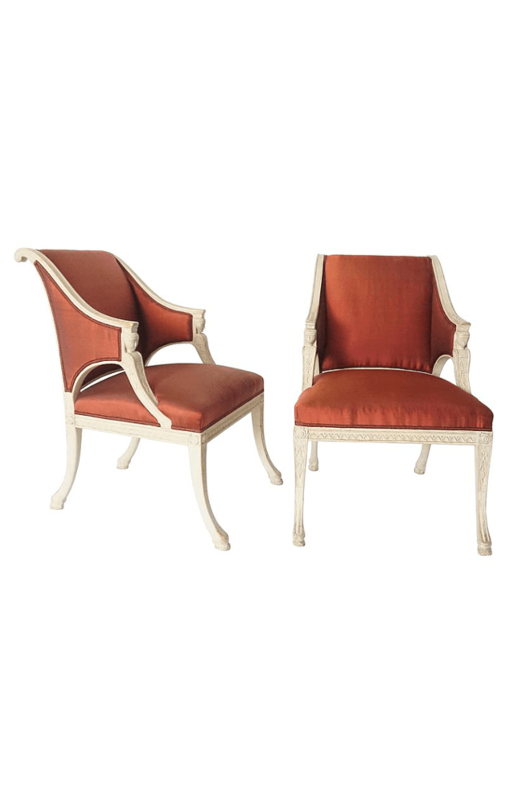 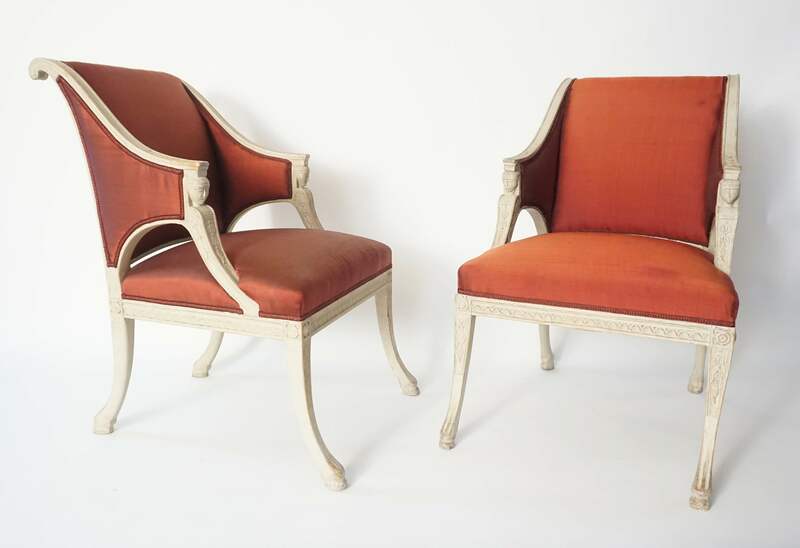 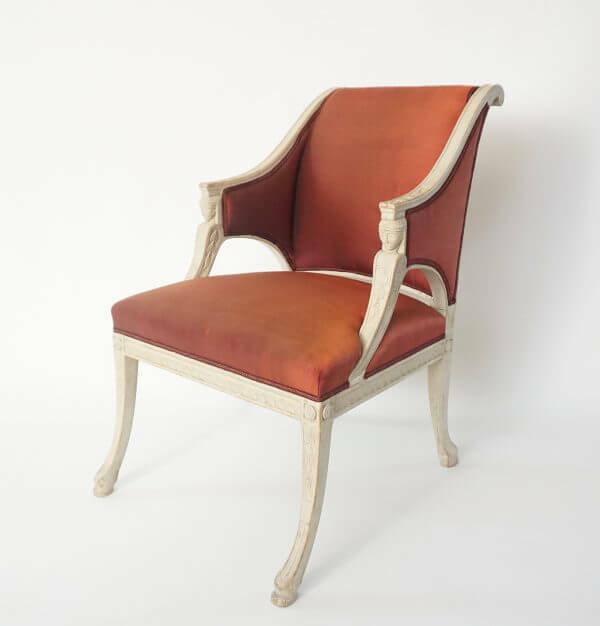 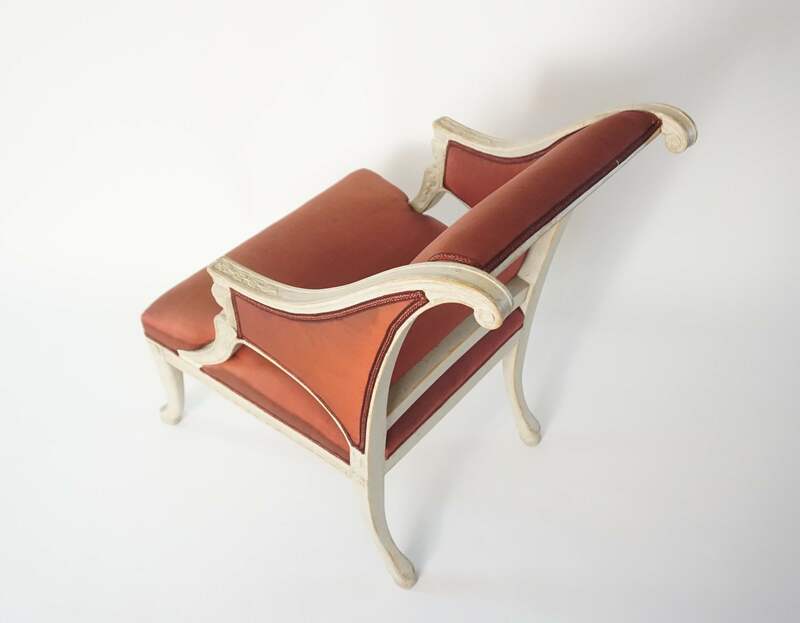 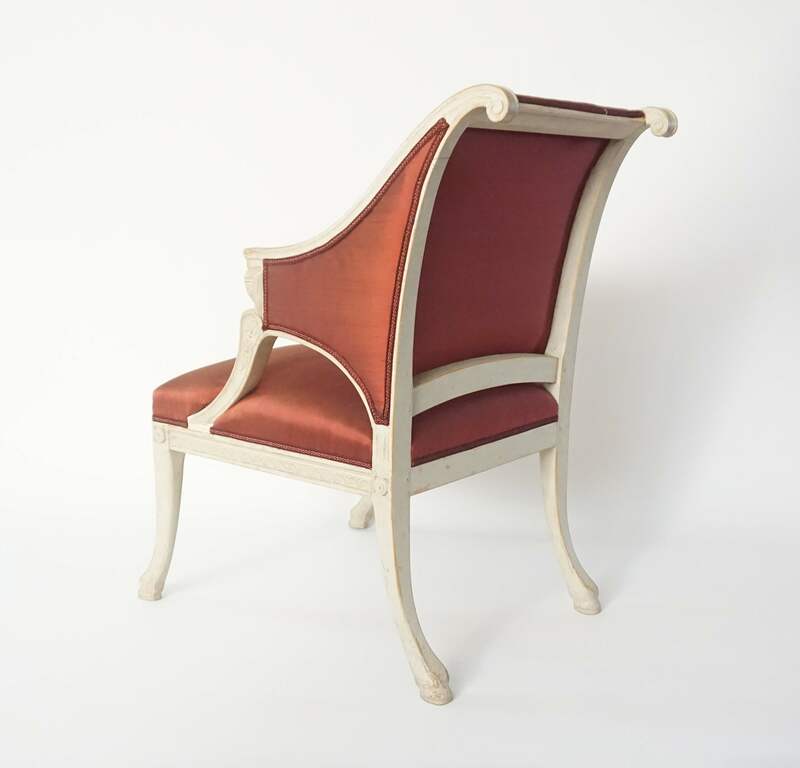 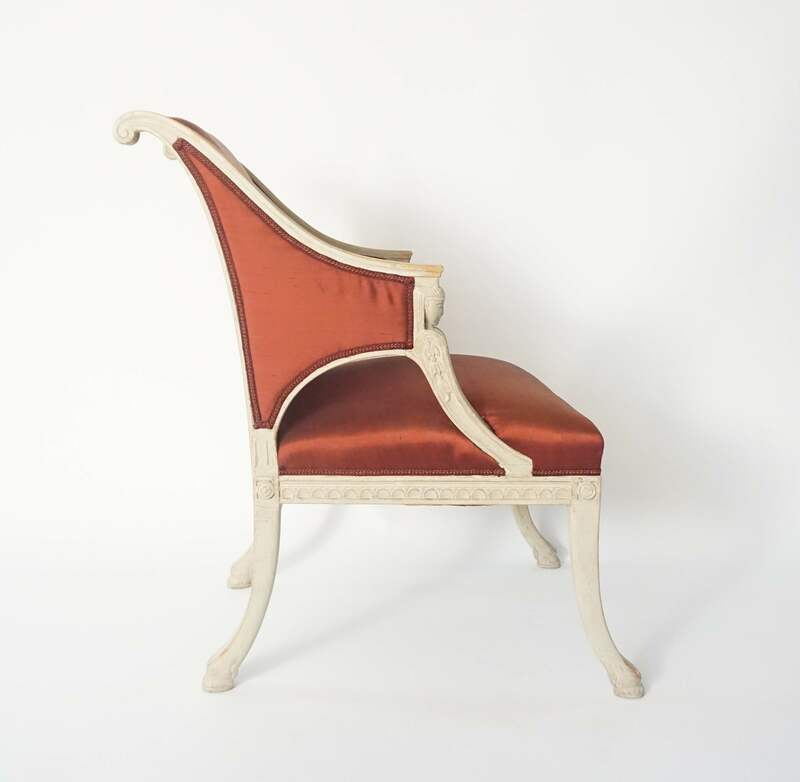 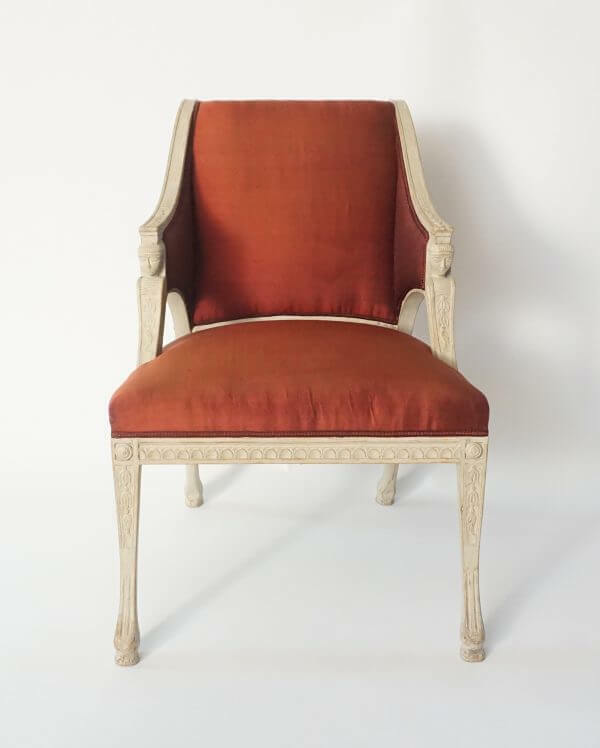 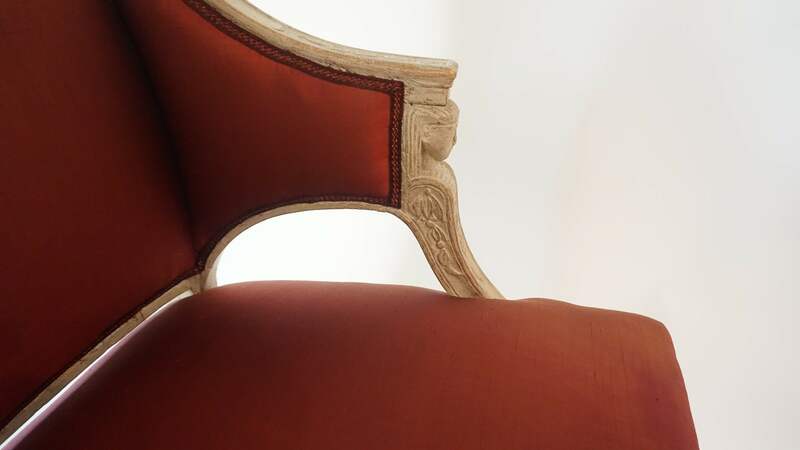 Rare and exceptional pair of Swedish Gustavian armchairs by Royal Court appointed chair-maker Ephraim Ståhl (b. 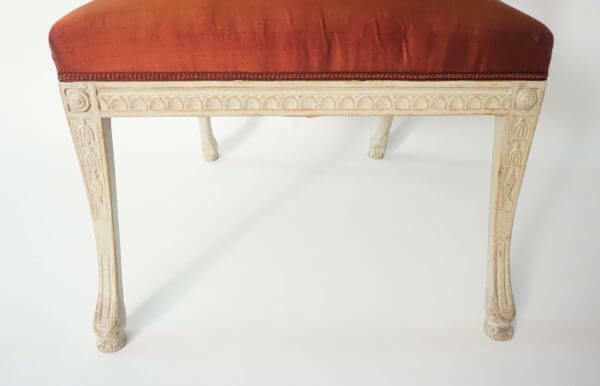 1768 - d. 1820) in original paint; the scrolled and upholstered arched backs issuing abbreviated sloping arms ending in carved female Egyptian sloping term supports with reed and bellflower motifs connecting deep upholstered seats on lamb's tongue rails with roundel corner-blocks surmounting dramatically splayed front legs with repeated carved bellflower motif ending in realistically carved goat-hoof feet and equally splayed rear legs on same hoofed feet. 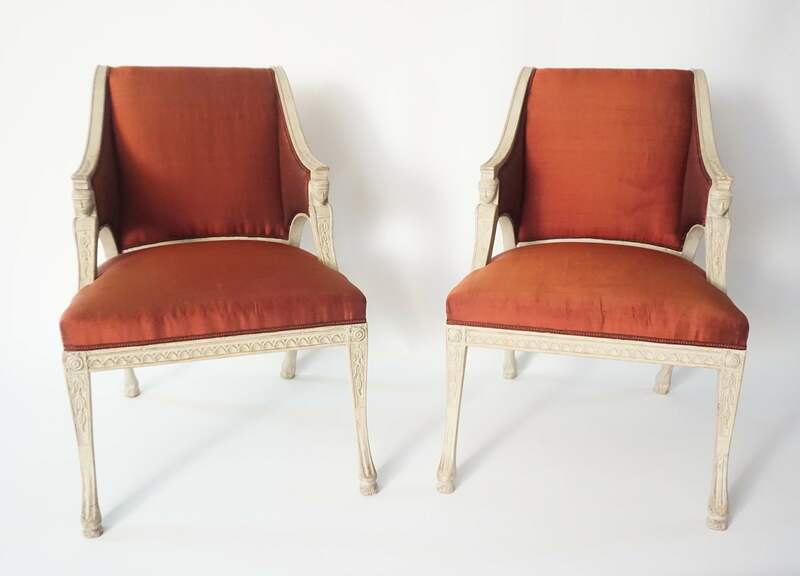 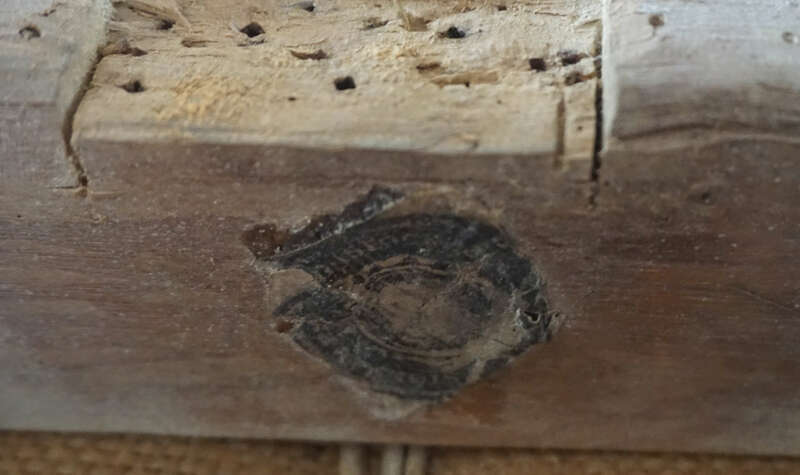 One chair with guild and makers seal marked internally as pictured, the other unmarked but of identical design. Biography: Ephraim Ståhl (November 22, 1768, Rauma, Finland - May 10, 1820, Stockholm, Sweden) was a Stockholm chair-maker made Royal Master in 1794 until death in 1820. 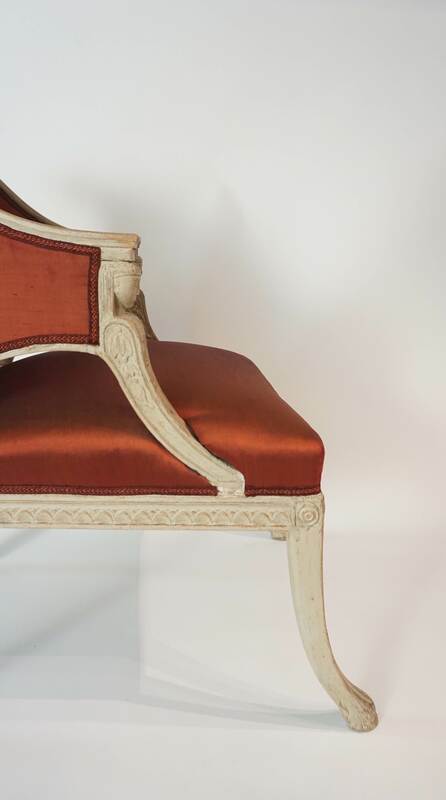 Kings' Gustav IV Adolf, Karl XIII, and Karl XIV Johann commissioned furnishings from Ståhl and his work is in the permanent collections of Stockholm Castle, Gripsholm Castle, Tullgarn Palace, Rosersberg Palace and the Swedish National Museum to briefly name. Rare and exceptional pair of Swedish Gustavian armchairs by Royal Court appointed chair-maker Ephraim Ståhl (b. 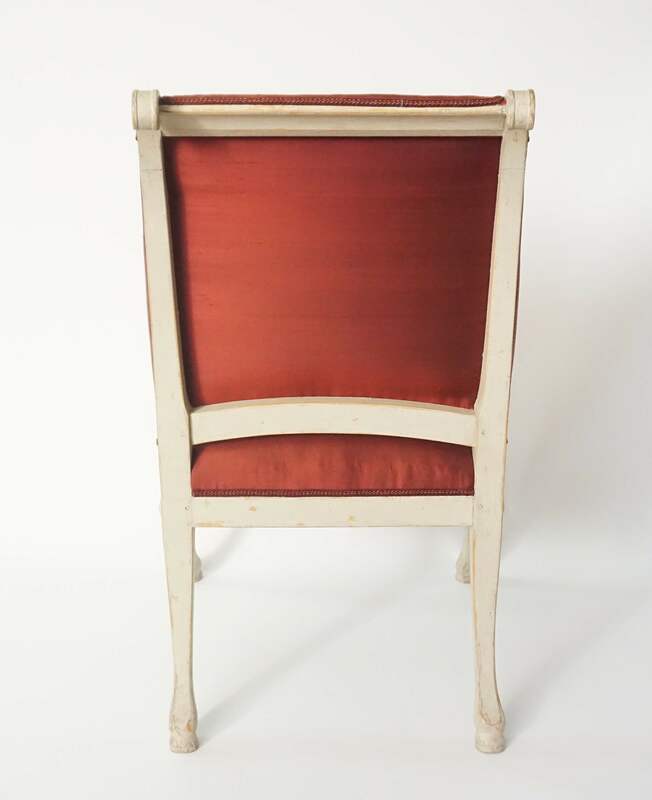 1768 – d. 1820) in original paint; the scrolled and upholstered arched backs issuing abbreviated sloping arms ending in carved female Egyptian sloping term supports with reed and bellflower motifs connecting deep upholstered seats on lamb’s tongue rails with roundel corner-blocks surmounting dramatically splayed front legs with repeated carved bellflower motif ending in realistically carved goat-hoof feet and equally splayed rear legs on same hoofed feet. 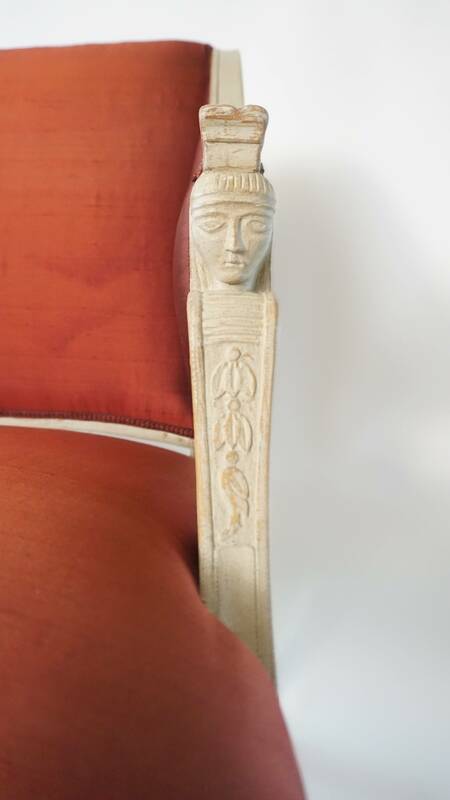 One chair with guild and makers seal marked internally as pictured, the other unmarked but of identical design. 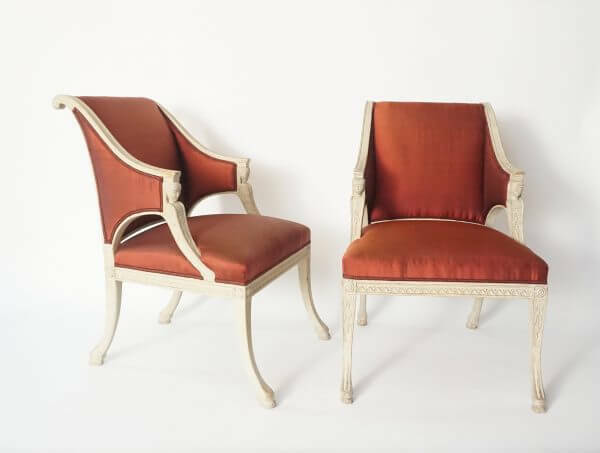 Biography: Ephraim Ståhl (November 22, 1768, Rauma, Finland – May 10, 1820, Stockholm, Sweden) was a Stockholm chair-maker made Royal Master in 1794 until death in 1820. Kings’ Gustav IV Adolf, Karl XIII, and Karl XIV Johann commissioned furnishings from Ståhl and his work is in the permanent collections of Stockholm Castle, Gripsholm Castle, Tullgarn Palace, Rosersberg Palace and the Swedish National Museum to briefly name.